Yamal, Siberia, Russia. 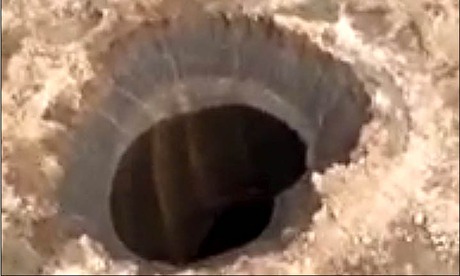 “Yamal,” roughly translated, “the end of the world.” It is here that scientists have discovered a gaping hole in the earth. Two hundred, sixty-two feet wide. Nearly a football field. Since it was only recently discovered, scientists are unsure how deep it is or exactly what caused it. In photos and video you can see rubble surrounding the cavity, indicating a fearsome blast from the inside out or a hellacious impact from the outside in. So often, I see what happens in nature as a metaphor for life, writing. I think this is partly why I’m fascinated by the natural world and biology. For me, there is inviolableness to nature and mystery, an inseparable quality between the two that points toward a sort of beauty I can only hint at with words. Try as I might, so many of my ways to describe the world, my faith, my own life and how it intersects with the lives of others fail to capture what are often stunning, heartbreaking, and joyous moments in a world that is at once opposed and welcoming of human presence. And because mystery surrounds so much of my writing and how I view my own life, I cannot separate mystery and nature. Recently, a colleague of mine told me she’s been working on a memoir for the past twenty years, and she’s currently working to transform it into a memoir and self-help hybrid, but getting the voice and tone just right has been tripping her up. She said she would just move on to other writing projects, but this one seems to be a barrier she can’t move past. It stops her dead. Always in the back of her mind, her memoir lurks. Deep holes frighten me. They are like yawning cavities atop which balance is compromised when we stare in for too long. Craggy sides that can break skulls, maim bodies. I worry if I get to close to the edge, lean too far over, I’ll be swallowed whole. I’ve been to the Big Island of Hawaii, perhaps another Yamal, twice and plan to go back as often as I can. I selfishly dream of living there one day, though I’m reluctant to because a part of me that believes its year-round beauty should be left to those who are native as well as to the volcanic evolution of death and rebirth, fiery death, watery birth, which seems largely opposed to the presence of humans. Even still, the island, twenty-five hundred miles off the mainland, draws me. The first time I went to Hawaii, I studied the volcanoes with a geologist as well as other students and curious alumni of the graduate school I was attending. While I am not a biologist, geologist or scientist, I wanted to see through the eyes of someone who’d plumbed beneath the surface. He took us to places rarely seen by tourists, including a lava tube in a native Hawaiian man’s back yard. The man dug out an entrance to the tube, an underground tunnel formed by free flowing lava, and gave private tours of it for a few bucks. On top of that, the geologist took us to yawning craters, formed by lakes of fire now cooled and hardened; he showed us holes formed when lava exploded from the ground from the build up of pressure because the lava had no where else to flow. In both cases, when I crept down inside the tube or leaned over the sides of craters, holding on to the hands of others in our group, I feared what I might find. I feared that I might fall in. I feared I might never find my way out again. I recently told my memoir/self help-writing colleague that I understood her need to finish her memoir project before she can move on to work on something else. I’m on the third draft of my own project (what I believe is the draft of the final form that it will take), and while there are other projects beckoning me, I can’t give up on this one. I’ve been hard at work on it for four years now. Its larger theme and structure has changed several times, but I’ve finally hit upon a universal theme that I’m satisfied, even pleased, with. I have always known the story, that is, the facts of it, but it’s taken me this long to find the story behind my story. Or rather, I’ve resisted the story because I thought it was about anger and forgiveness. But in reality it was something else. The story is love. The mystery is love. I believe it’s what we’re all after in one way or another. In my faith tradition, Evangelical Christianity, the fall of human beings into sin is understood as the common human condition. I’ve begun to believe that the common human condition is the search for love, and sin is simply a result of the selfish pursuit of things that serve as substitutes for love. Sin is brutally steamrolling others into the ground to get what we want. The thing with love in faith and art and life is that it doesn’t always equate to what we believe a happy ending should be, which is why I think I’d been so resistant to the idea that love was my universal theme. It’s why we so often find that we can’t leave our stories of love behind. They’re dangerous. Sometimes when we fall into that hole, we crack our skulls open. Sometimes, we walk with a limp the rest of our lives. Sometimes, though, it’s the love that finds us when we crawl to the edge and peek into what, at first, looks like a void. The fall changes you. But that’s why so much of art and life and our search for meaning center on love. It’s a deep hole. The end of the world. One that stops us in our tracks. One that needs exploring.